3. Symptoms: Natural Aging, “Overdoing” It, or CCLR? 5. What Happens If My Dog’s CCLR Isn’t Treated? 6. What Are My Dog’s Torn ACL Treatment Options? 7. What Is TPLO Surgery? 8. Why Is TPLO The Preferred Treatment for CCLR? 9. Is My Dog a Good Candidate for TPLO? You’ve noticed your dog has been favoring her hind leg, so you take her to see your regular veterinarian. After running a few tests and taking X-rays, your vet tells you your pet likely has a cranial cruciate ligament rupture (CCLR or Torn ACL). After a brief description of CCLR and how it will affect your dog’s mobility if left uncorrected, he recommends a number of treatment options and encourages you to consult with a veterinary surgeon who specializes in tibial plateau leveling osteotomy (TPLO / Dog Torn ACL Repair). By now, you might feel overwhelmed by “information overload”, and you’re concerned for your dog’s well-being. You want to make an informed decision as you create a strategy for easing your dog’s discomfort and returning her to an active life, but you’re not convinced that surgery is the best choice. You ask your vet if he can recommend further reading, and the next thing you know, you’re here at TPLO Info, the leading resource for learning about tibial plateau leveling osteotomies and the surgical vets who perform them. We invite you to explore our informative literature and videos, but before you jump into the deep end, we’ve compiled an overview of the TPLO process… and why it’s become the leading treatment for cranial cruciate ligament ruptures. You probably know at least one person who’s had surgery to repair a damaged anterior cruciate ligament, most commonly referred to as the ACL. That person might be you. The cranial cruciate ligament is the canine counterpart to the ACL, and among both dogs and humans, tears or ruptures in these ligaments aren’t uncommon—but that doesn’t make them any less painful. Ligaments are tough, fibrous bands of tissue that hold bones and cartilage in place. We have two ACL ligaments that connect the thigh (femur) bone to the shin (tibia) bone. These ligaments cross over the knee joint and withstand the stress of physical activity while stabilizing the joint. Dogs have four ligaments to secure their stifles (knee joints, in vet speak) with the CCL being the most vulnerable to injury or wear-and-tear. Sports-related trauma, including twists and hyperextension, is among the leading cause of ACL damage in humans. Dogs are different. They don’t have to suffer trauma to experience a ruptured CCL because their physiology and biomechanics leave them vulnerable to CCL damage. A canine tibia has a more pronounced slope than its human counterpart, adding stress to the ligaments designed to stabilize and connect the leg bones. This incline is called a tibial plateau slope, or TPS. When the CCL is damaged or simply worn out, friction between the bones can cause arthritic pain and damage to the surrounding cartilage. Cranial cruciate ligament ruptures can affect any dog of any age, though some breeds, including golden retrievers and rottweilers, are more prone to CCLRs. Dogs with more pronounced tibial plateau slopes are especially vulnerable to ruptured, torn, or overextended CCLs and, for reasons still being explored by orthopedic veterinary specialists, female large-breed dogs in their prime make up a disproportionately large number of CCLR cases. In humans, vigorous exercise and physical sports are the most common causes of ACL injuries, but dogs who don’t get regular exercise are actually at greater risk of a CCLR. The added weight of a dog in poor condition creates downward pressure on the stifle, and it’s this pressure—not contortions or impact—that gradually undermine the ligament’s elasticity and strength. There’s no surefire way to prevent CCLR other than to keep your dog fit, feed her a quality diet, and to consult with your veterinarian about giving your pet joint-supporting supplements. Symptoms: Natural Aging, “Overdoing” It, or CCLR? Some vets and publications use the term cranial cruciate ligament disease (CrCLD), and others use CCLR when referring to cranial cruciate ligament issues. In the end, your dog is affected in the same way: She hurts. CCLR symptoms build up over time as the injury worsens. Sometimes, the symptoms seem to come out of nowhere. At first, you might think your dog has sprained her leg, or that she’s developing arthritis. If we don’t know exactly what we’re looking for, the red flags are very much the same. Has your dog appeared stiff or sore when getting onto her feet, squatting, or sitting? Is she suddenly acting like her daily walk is an obligation? Do you have to help her get into your car? Does she hesitate at the foot of the steps and stairs, or appear to climb (rather than conquer) them? Is she favoring one hind leg over the other? Have you noticed swelling on the inside of her back leg? After a lifetime of trying to keep her off the sofa, does she suddenly refuse to climb onto the sofa? As we get older, we all get creaky, and we expect our dogs to do the same. We tend to write off these symptoms as part of the natural process of aging. After all, cranial cruciate ligament ruptures can contribute to osteoarthritis, and when the ligaments aren’t functioning properly, destabilized leg bones grind against one another just the same as if deteriorating knee cartilage were the original cause of your dog’s discomfort. We might hold off on taking an older dog to the vet when she experiences symptoms we assume are related to ordinary aging, but when our younger dogs lose their mobility and show signs of joint pain, it’s easier to recognize that something might be very wrong. The good news is that an early CCLR diagnosis means that a full or near-complete recovery is possible, while degenerative arthritis treatments focus on pain management and symptom alleviation. Timely CCLR diagnosis and repair can delay or prevent further cartilage and bone deterioration by relieving stress on the ligaments that support your dog’s stifles. Our primary care providers are general practitioners, trained to identify health issues and refer us to specialists when necessary. 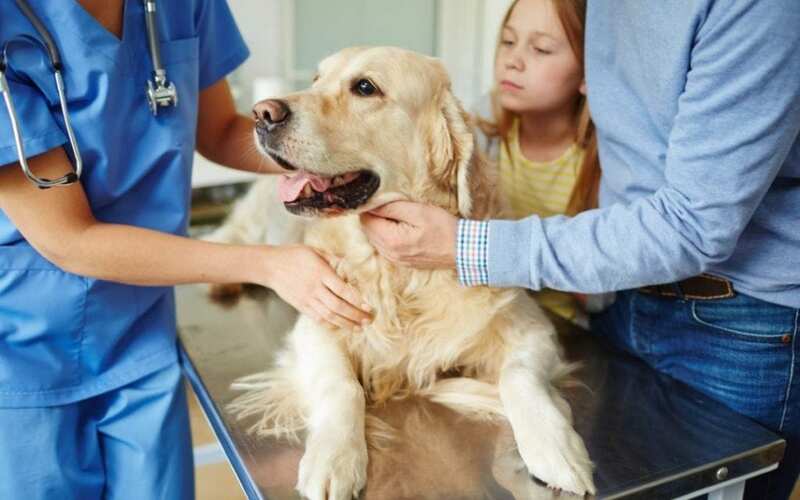 Veterinarians, though they regularly perform surgeries, will do the same when they suspect that an illness or injury is outside the realm of their specialty. Your dog’s “GP” can identify CCL problems through visual exams, palpations, and x-rays, but veterinary surgeons with focused experience in diagnosing and repairing CCLR are better-equipped to identify and navigate potential complications or co-occurring issues. When you consult with a veterinary surgeon after your vet’s preliminary cranial cruciate ligament rupture diagnosis, it’s not unusual that he’ll take a new set of x-rays from specific angles. As your veterinarian did, your surgical specialist will manipulate your dog’s joints and observe her gait to get a better feel for the severity of the CCLR. 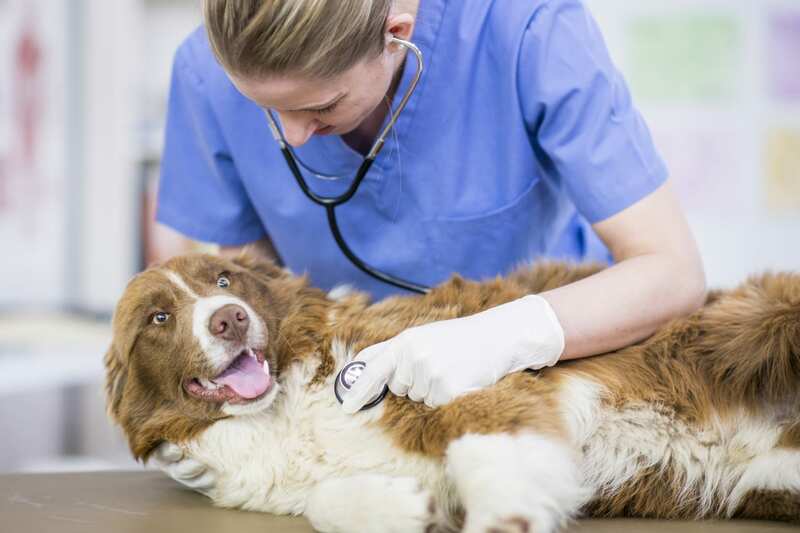 He’ll look for fluid buildup in your dog’s joints, pre-existing arthritis, fragmented bone material, and other factors that could rule out other diseases, complicate surgery or require attention when your pet is on the operating table. Some CCL damage, while evident in your dog’s symptoms, is hard to identify through routine exams and x-rays. Veterinary surgeons who’ve “seen it all” can identify and gauge ligament tears and ruptures that could otherwise go unnoticed. CCLR is a serious condition. With the right procedure, conducted by the right surgeon, most dogs can recover, but only after a timely and complete diagnosis. What Happens If My Dog’s CCLR Isn’t Treated? The first thing to understand is that CCLR does not heal on its own. Slight tears or ruptures in the cranial cruciate ligament are more likely than not to lead to further damage or even complete tears, and aging ligaments will continue the degenerative process as the ligament loses its elasticity. According to the American College of Veterinary Surgeons, 40-60% of dogs that have CCLR in one leg will, in the future, develop a similar problem in the other. When these ligaments aren’t functioning properly, the tibia and femur become destabilized, leading to friction within the joints. The resulting arthritic pain reduces your dog’s mobility and desire to exercise, leading to poor muscle tone and obesity—both of which further compound the risks of further injury and secondary health issues, not to mention the time and expense of treating them. Imagine your dog chasing her tail to the point of exhaustion. Remove the entertainment value, and you have a spot-on metaphor for the degenerative nature of untreated CCLRs. What Are My Dog’s Torn ACL Treatment Options? Non-surgical approaches to repairing a CCLR are limited to pain management strategies, diet regulation, and encouraging your dog to get as much exercise as she can withstand without causing her further discomfort or injury. There are experimental procedures in which your dog can receive injections of platelet-rich plasma and stem cells to reduce inflammation and possibly increase the health of knee cartilage, but studies about the effectiveness of these injections have produced inconsistent results. Repeated injections into the joint may expose your dog to infections. The best way to restore stability to your dog’s knee joints and return her to an active, high-quality life is to surgically repair her damaged cranial cruciate ligament. When people undergo ACL surgery, surgeons graft a section of cadaver ligament to repair or replace the damaged tissue. While there are similar surgical procedures for canines, the tibial plateau slope increases the odds for replacement tendons—biological or artificial—to wear out or stretch. That’s why veterinary surgeons recommend a procedure called tibial plateau leveling osteotomy, which addresses the structure of the bone itself. Tibial plateau leveling osteotomy is a procedure that, simply put, decreases the angle at the top of the tibia. This reduces strain on your dog’s CCL and allows the tibia to better support the femur’s downward pressure without relying as heavily upon the repaired or aging ligaments. During the operation, your veterinary surgeon will cut and rotate a portion of the bone, inserting a plate and screws to secure the graft while it heals. This alteration levels the tibia, preventing the femur from sliding down and off its surface. In more than 96% of TPLO treatments, the plate and screws are left in place after the eight week period in which they’re needed to support the healing bone tissue, so further surgery to remove them usually isn’t necessary. If your vet opts to remove these materials, the procedure is simple and won’t complicate or prolong your dog’s final recovery. Why Is TPLO The Preferred Treatment for CCLR? Tibial plateau leveling osteotomy surgery, while it sounds like a severe procedure, doesn’t rely upon the implantation of artificial or grafted ligaments to stabilize your dog’s knee joints. If for some reason, grafts are necessary, the altered tibial plateau will enhance and prolong their effectiveness, just as it does for your pet’s natural CCL tissue. TPLO surgeries typically allow your dog to go home the day after the procedure, reducing psychological stress on both you and your pet and keeping your vet bills low. Recovery is relatively quick; you can expect your dog to be up on her feet and putting weight on her leg within a few days, and after a period of restricted activity defined by your veterinary surgeon, she’ll likely be able to participate in all or most of the activities she enjoyed before her CCLR symptoms first appeared. TPLO isn’t an experimental treatment. It’s been around for more than 20 years, and during this time the most talented veterinary surgeons have refined the technique and shared their knowledge among their peers. More than 200 academic papers document the effectiveness of TPLO, and outcomes are overwhelmingly positive: A reported 90% to 95% of cases achieve good to excellent outcomes. “Good” is defined by the need, on occasion, to administer oral anti-inflammatories after long periods of romping around (the dog, not you), while “excellent” results mean that your pet once again becomes as active and exuberant as any other dog her age. Perhaps more so, because other dogs might be living with undiagnosed and untreated CCLR. They could be on track to experiencing issues related to exaggerated tibial plateau slope measurements, worn out ligaments, or early-stage ruptures or tears. Overall, your pet will experience far less stress and pain during the procedure and the recovery process than she would if she were to spend the rest of her life dealing with the painful symptoms and increasing health complications associated with ineffective or absent CCL treatments. While surgery is never inexpensive, accumulated vet bills resulting from untreated illnesses and injuries are never cheap. There is no price tag for TPLO’s potential to improve and protect your dog’s quality of life within the first few weeks following her surgery. Is My Dog a Good Candidate for TPLO? That’s a team decision made by you, your family veterinarian, and your TPLO surgical specialist. When you consult your veterinary surgeon, he will evaluate your dog’s overall health to determine whether or not she will benefit from CCLR surgery. Any procedure requiring anesthesia is a risk, and your dog’s physical condition and age are important factors in determining whether surgery is the best option. Tibial plateau leveling osteotomy and other CCLR treatments can’t reverse secondary damage caused by CCLR, nor does it address other issues related to your dog’s knees. Torn meniscal ligaments, problems with the patella (kneecap), and arthritis are separate issues that TPLO can ease, but not repair. Pre- or co-existing issues can reduce your dog’s chances for long-term results after any surgery, and some conditions can aggravate—or become aggravated by—her TPLO procedure and recovery. Your veterinary surgeon might recommend that your dog lose weight prior to the surgery, or that you consult with your regular vet to address and remediate existing issues that could hinder your pet’s outcome. Another factor in determining whether or not your dog is a good candidate for any surgery? Your willingness and ability to help your dog through the recovery process. It’s important to schedule your dog’s surgery and your own time so that you can stay with your pet for a day or two after she leaves the veterinary hospital. Your goal is to keep the home quiet, restrict your dog’s access to stairs, and help her go outside (or use indoor training pads) to relieve herself. Veterinary surgeons recommend TPLO over other surgeries for many reasons, but a major benefit to this procedure is the relative ease by which the patients recover. In most cases, dog owners are surprised by how quickly their pets are back to running around and doing their own thing, but for the first few days, “doing their thing” can’t be done on their own and will need your assistance. If your veterinarian has prescribed pain medications, your dog will be a little woozy and might experience balance issues, and even with medication, she’ll be a little sore. If you have a large dog, be prepared to help her up and support her as she moves around. Your vet can recommend certain lifting techniques, or you can have a friend or family member aid you in “spotting” your pet. Prior to her surgery, you’ll want to set up doorway gates or, for smaller dogs, portable pens to keep them confined. Make sure all her bedding is clean to reduce the risk of infection. Ask your vet if your dog will need a special diet after her surgery; sometimes a simple meal of chicken and rice is easier on your dog’s digestive tract the first 24 hours after her operation. Your dog will wear an Elizabethan style collar (often called the “Cone of Shame”) to prevent her from licking or chewing her sutures, and you’ll need to prevent her from getting those sutures wet from sprinklers and other water sources. Sit down with family or household members to explain your dog’s condition and post-op needs. Small children might not understand the importance of keeping household noise excitement to a minimum so it might be wise to keep your dog on the margins of home activity. Avoid isolating your pet, as dogs like to be around their people and might not settle down if they’re shut away from their “pack”. All of this is standard advice in any post-operative recovery, but for the first several weeks following her surgery, you’ll need to ensure that your dog takes it easy as she heals: No running or jumping, and until the sutures or staples heal, no baths. Swimming, on the other hand, is an excellent rehabilitation exercise after the initial healing period and once your vet gives your dog the green light. It’s low-impact, it burns off a lot of energy, and it helps your dog keep the weight off. Of course, if yours isn’t a “water dog”, you’ll have to settle for leisurely walks on the leash. Your veterinary surgeon will recommend an easy-to-do physical therapy routine to reduce swelling in your dog’s joints, stimulate her muscles, and prevent stiffness. He’ll also give you tips on checking for infections and changing bandages. 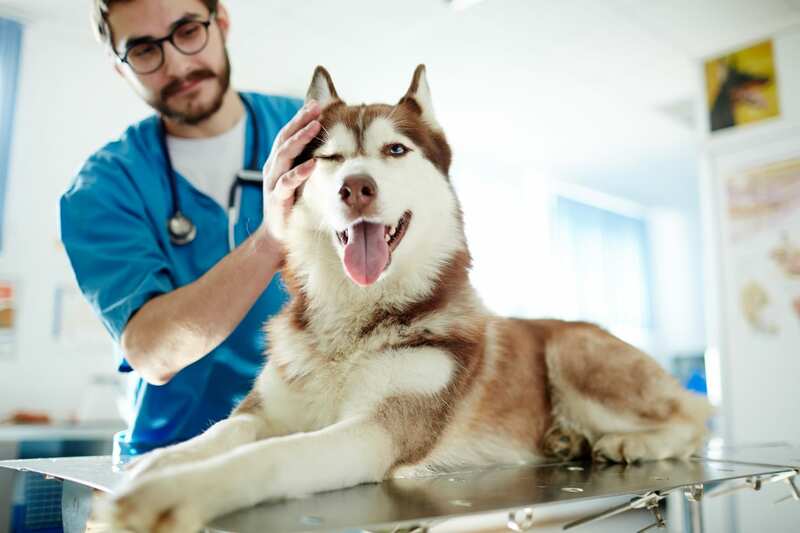 You’ll need to return to your vet to have sutures or staples removed, and your TPLO specialist will conduct a follow-up consultation to evaluate the surgery’s success. Most dogs return to normal activity in about eight weeks. Older dogs, or pets with pre-existing issues, might require more time to catch up. It’s nearly impossible to answer every question about a surgical procedure or pet injury. 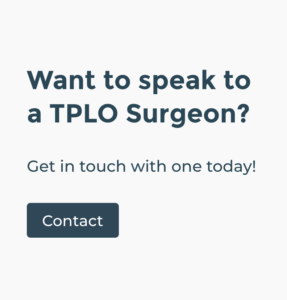 If you have more questions, visit our Frequently Asked Questions page, or browse our free, comprehensive 6-StepsTM online guide to see beginning to end about TPLO. We’ve included videos to help you understand CCL injuries and the TPLO process from diagnosis to recovery. Once you’ve decided that TPLO is your preferred course of action to give your dog the best quality of life, you’re ready to move forward with your dog’s treatment. Even though tibial plateau leveling osteotomies are widely recommended and performed within the veterinary field, you want to trust your dog to the most highly-qualified veterinary surgeon in your area. TPLO Info provides pet owners with current and comprehensive information about tibial plateau leveling osteotomy, but we also have a network of preferred TPLO Info Partners. 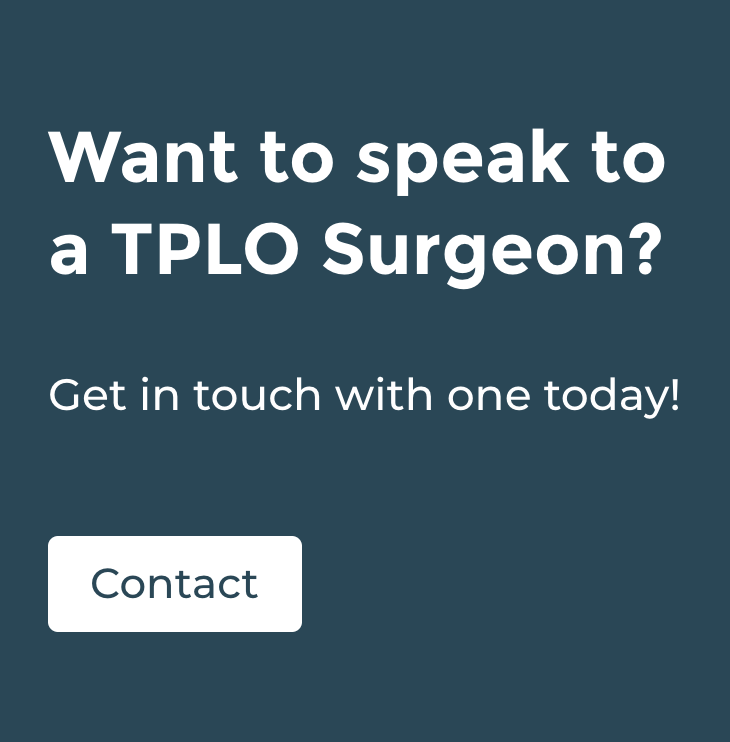 Just click on the link to find a TPLO Surgeon near you. Our network of specialists allows you and your regular veterinarian to select the most qualified TPLO specialists so you—and your dog—can take the next step with confidence.